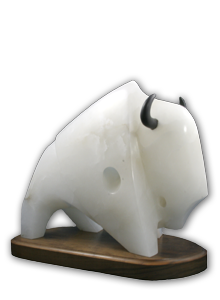 A long time ago, the Sacred White Buffalo Calf Woman came to Earth and gave the Lakota people a Sacred Pipe and a small round stone. These gifts were to be used in the first rite, Keeping of the Soul, which she taught them. She also said six other rituals would be revealed to them. "There will be four ages, and I will look in on you once each age. At the end of the four ages, I will return." As she left, she changed from a beautiful maiden into a black buffalo … then a red-brown buffalo … then a yellow buffalo … and finally into a white buffalo. And then, she disappeared into the clouds. The bowl of the pipe she gave the Lakota was made of red stone, representing the Earth. A buffalo head was carved on the bowl, symbolizing all of the four-legged animals of the Earth. The stem was wood and represented all that grows on the Earth. Twelve eagle feathers hung from the place where the bowl joined the stem; this symbolized all the birds. The round stone was made out of the same red earth as the pipe and had seven circles on it representing the seven rites. When a Lakota smokes a sacred pipe, his or her voice is sent to Wakan Tanka - the Great Spirit. A central part of each sacred rite is smoking the sacred pipe. The smoke from the pipe is the visible breath. The Sacred Pipe, Black Elk's Account of the Seven Rites of the Oglala Sioux, recorded and edited by Joseph Epes Brown.